Flounder Heights is a multiplayer stage in Splatoon. It is a map set on an apartment complex with many high vantage points and low, corner-based areas. It is a vertical stage with many inkable walls, allowing for a number of navigation options. The center of Flounder Heights contains two towers connected by a grated bridge. This is probably where most fighting will occur, as the only way to get to the other side of the map is by going over the towers or through the alley beneath the bridge. There are two alleys separate each team's base from the Central Towers. They each consist of one tree for cover. 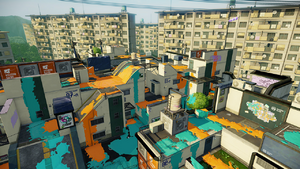 The bases in Flounder Heights resemble the Starting Areas in Saltspray Rig; the other team cannot reach the higher part of the plaza, and there are four ways of exiting into the Low Alleys. On both sides of the map is a map that shows where ink from both sides of the map are, from a top-down perspective. It's not that useful as you always have a map with you on the GamePad. This map includes two Splat Zones, each zone is located on one of the two roofs of the Central Towers. The high ground is the main battlefield of this mode and using the buildings' walls can make for great access to either zone. The tower is located at the center of the map in the lower path between the two main buildings. When ridden, the tower will travel over the divider wall and travel down through the Low Alleys before traveling into the lower part of the rivals' Starting Plaza. The goal points are at the center of each sandlot in both Starting Plazas. The Rainmaker in Flounder Heights is located on top of the grated bridge in the center of the map. The goal is located outside of the opposing team's base in the sandlot below the Spawn Point. Three stacks of boxes have been added to help the attacking team get inside the enemy team's Starting Plaza. Flounder Heights was revealed during a Japanese promotional trailer depicting new updates on 24 July 2015. It was released on 20 August 2015. In addition to changing the stage layout in Rainmaker, other adjustments have been made to prevent users from taking certain shortcuts in all modes and to prevent the attachment of Suction Bombs in certain places. Adjustments made to prevent players from taking certain shortcuts in all modes. Adjustment made to prevent players from taking unintended shortcuts in Tower Control mode. A fight taking place down below on the streets. A high view of pre-release Flounder Heights. Rainmaker being played on Flounder Heights. A team of Inklings spawning at Flounder Heights. Animated GIF of an Inkling firing a Heavy Splatling in Flounder Heights. Still of the same Inkling. Top-right view of Flounder Heights. Bottom-right view of Flounder Heights. Bottom-left view of Flounder Heights. Top-left view of Flounder Heights. The Park seen at Flounder Heights. Two sparrows on the ground at Flounder Heights. Two more sparrows on a wall. One of the flowering vines near Flounder Heights' Spawn Points. A bulletin board at Flounder Heights. A jellyfish dancing on a balcony next to one of Flounder Heights' Spawn Points. A jellyfish silhouetted in a window during a Splatfest. Lights on in the windows. The night sky over Flounder Heights during a Splatfest. The map's name is a reference to the real-life flounder. This map was featured in some promotional imagery for the release of the Rainmaker mode, before it was released. This stage's name was accidentally shown in a GameXplain preview video, long before it was properly revealed. Cicadas can be heard singing from the trees throughout the level. The audio used is similar if not identical to that of the Brown Cicada, Walker Cicada and Robust Cicada. The cicadas will also sound agitated if their tree is inked. During Splatfest, which takes place at night, crickets sing instead. According to Callie, the time of day that battles happen at Flounder Heights is in the afternoon at sunset. Near the end of a match, the horn of a tofu seller can be heard. The internal codename for this stage in the game files is "", from the Japanese 城壁 (じょうへき), "Castle wall". Hiramegaoka Danchi Hiramegaoka Housing Development. Hiramegaoka is a portmanteau of the words hirame and oka, translating to "Flounder Hill". French (NOE) Lotissement Filament Housing development named "Filament"
Italian Cime sogliolose Sole Heights, sogliolose comes from sogliola. Might be referencing "Cime tempestose"
This page was last edited on 26 February 2019, at 16:41. This page has been accessed 31,264 times.